You love your aging parent, but that doesn't mean you should be their primary caregiver. So why don’t we approach the question of who should be the primary caregiver for an aging loved one with the same logic? I knew a woman who couldn’t stand her mother, balance a checkbook or stomach the thought of organizing another person’s life. She was wracked with guilt about how to handle her mom’s physical decline. As the only daughter with two male siblings, she assumed she was drafted for the role of caregiver when it came time to intervene and help her mother navigate her failing health. Another time, I interviewed a man who wanted to help his ailing parents, but didn’t have as close an emotional relationship with them as his brother and sister did. He worked in finance and his parents needed help with handling their money, so I suggested he quit trying to do a little bit of everything, some of which was out of his comfort zone, and instead, talk to his siblings about “dividing and conquering.” That way, he could take on the focused and essential role of financial caregiver while his siblings addressed their other needs, such as taking them to doctor appointments and talking nightly by phone. As you consider an aging loved one’s needs now and in the future, remember that there are lots of ways to help, and not everyone is cut out for the demands of a primary caregiver. Remove the emotion and the “shoulds” and consider these valid reasons why you shouldn’t be a loved one’s primary caregiver. You don’t particularly care for the caree. Think about it. You spend most of your lives together in contention and yet, when she’s older, you’re supposed to snap to it and become mom’s BFF and caretaker extraordinaire. At best, that’s a stretch. At worst, it’s a no-win situation for you both. Your tenuous relationship to the caree before their caregiving needs took center stage will influence whether or not you’re the right choice to lead the charge when their care needs grow. Your family dynamics are too challenging. You see it all the time – brothers and sisters who don’t get along squabbling over who’ll do what to help mom or dad. It can become more of a power struggle between family members rather than a well-designed plan for tackling the caregiving challenges at hand. If your family dynamics are difficult, maybe it’s best to step back from infighting and, in the interest of keeping the peace, let someone else take on the primary caregiver role. Your skill sets don’t include managing people and money. It may be hard to admit that you don’t have the organizational or bookkeeping skills to plan ahead for a caree’s busy life or make sure they pay their bills on time. Look at managing people and money as skill sets and, just as you would if you were hiring for a position, aim to find the best person for the job, whether it’s someone from inside the caree’s inner circle or trusted outside help. You’re already maxed out in your work and home life. The common term for those who manage the lives of both their children and parents is “the sandwich generation.” They’re caught between two extremely demanding groups, while often attempting to work fulltime, manage a relationship of their own and eke out some semblance of a social life. Caregiving sometimes falls to the least burdened member of the family – the single one or the one whose kids have flown the nest – for a reason. While that’s not always fair, it makes sense. If you’re maxed out because the kids aren’t going to get to school and doctor appointments on their own, that may be all you can swing. How are you going to take on primary care for anyone else? Patience isn’t your strong suit. This is a hard one for most people to admit. We like to think of ourselves as having the patience of Job. But even Job would find the role of primary caregiver daunting. You not only need to be patient with the time it takes to handle someone else’s life, you need to be patient with the “someone,” too. Talking to Medicare folks on the phone or standing in line at a bank to share your Power of Attorney so you can make financial decisions on the caree’s behalf can quickly consume hours. Add that to the patience required to walk and talk slower to accommodate the caree, communicate in a different way than you’re used to and engage more physically and emotionally than you might have previously, and you may end up overdrawn on your reserves of perseverance and unflappability. You’re not equipped to manage the level of care required. 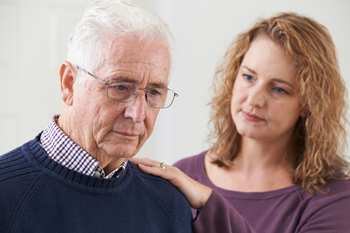 No one likes admitting that they may not be up for a task, but reality sets in once you assess the level of effort required to manage a loved one’s needs. There are several reasons why you may be ill-equipped. Perhaps you’re physically unable to lift a non-ambulatory person out of bed to go to the bathroom. You don’t know enough about the disease afflicting your loved one to advocate and support them. You can’t watch the person 24 hours a day, but if you don’t, they risk falling or getting lost. Or, maybe you’re not in the greatest health yourself and could put both you and your loved one in jeopardy if you overextend yourself. When it comes to caregiving, the bottom line is doing what needs to be done to help the person in need. That means different levels of care for different people since every situation is unique. Of course, not everyone can afford outside help. But if you can afford it, and your caree is open to it, you have more options and can possibly circumvent potential challenges such as being maxed out with your own life or fighting with siblings who share the burden. When possible, sometimes the best thing to do is step aside. You can show your love and support in other ways, by calling and visiting as frequently as possible or, as the man in the example above did, by aligning your efforts with your expertise, like managing finances. If, for whatever reason, you decide against being your aging loved one’s primary caregiver, support the person who is best suited to lead the charge, whether it’s a family member, a professional in-home caregiver or someone at a senior care community. "Creating a care team is important for every caregiver; caregiving is not a job that can be done alone. Everyone who comes to the care team has their own set of talents and skills and it will be important for the leader of the care team to utilize everyone's specific talents. But let's be honest, not everyone is cut out to be a caregiver! Family baggage, unfinished business, you name it, every family has it at some point. While in the midst of caregiving, the added burden of dealing with past family history makes caregiving more difficult. Find your comfort zone as a caregiver, and if your comfort zone is not to be a caregiver, then you are making a good choice for you, the care team and the caree." -- Christopher MacLellan, caregiving advocate, author of "What's The Deal with Caregiving"